No, because orders are immediately processed and sent to our shipping department for packaging and shipping. Do I have to create an account to purchase items online? Yes, you will have to create an account to place an order on our site. Click here to create an account. Creating an account allows you access to your account information. Once you have created an account, all your information (except payment information, for security protection) will automatically be entered during the checkout process. You will have access to your order history for viewing past invoices. If we are out-of-stock on an item, just click the notification button on the product page, and we will notify you when more product is available. When logged in, you can even save items in your shopping cart for a later purchase. Yes, located in Huntsville, Texas. Although most of our business is done through online sales, products found on our website may not be available at the retail store. Give us a call at 1-866-988-ABLE if you wish to stop by and pick up an item. No, we only ship to the contiguous 48 states and to Alaska and Hawaii. Some restrictions may apply, check local laws. Does my order have sales tax? Sales tax will be applied to all orders purchased by Texas residents and orders shipped to locations in Texas. Yes, in the interest of protecting your privacy and securing your personal information, cookies must be enabled to shop online at our store. By enabling cookie support in your browser, the communication between your computer and our site is strengthened. From the AOL Toolbar, select "Settings". 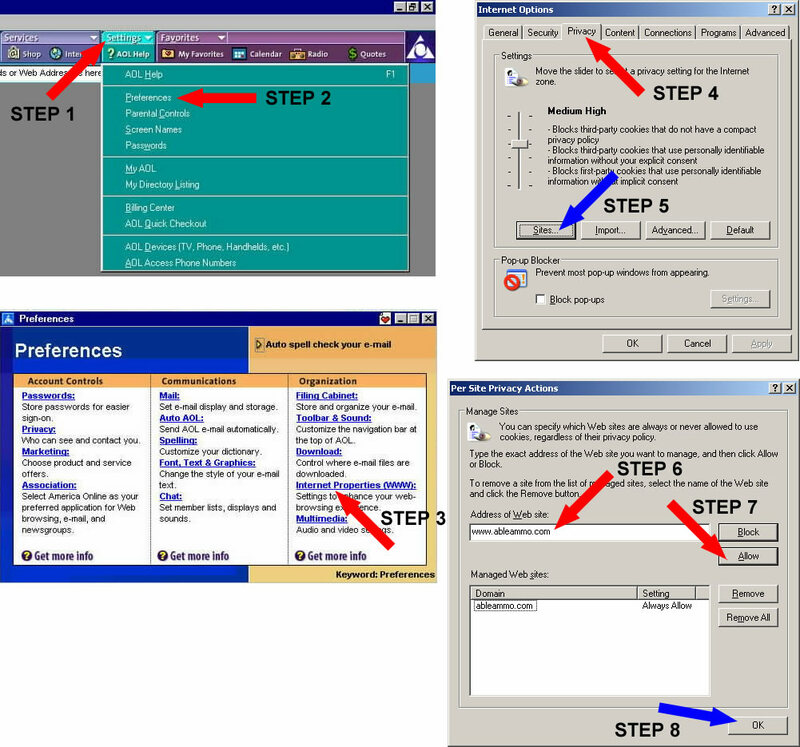 Select "Use your Internet Explorer Settings" to set advanced browser options. "Deselect" override automatic cookie handling button. Select "Allow", you should now see ableammo.com listed in the box below. How can I change my account profile information? You must first login to your account to make changes to any of the fields in your profile. Click the arrow beside your name in the top right corner and select "Account Info" from the drop down. Click "View or change my account information" on the newly loaded page. You must first login to your account. Click the arrow beside your name in the top right corner and select "Account Info" from the drop down. Click "Change my account password" on the newly loaded page. Once your order had been shipped you will receive an email with a UPS tracking number. You can also check the status of your order online by logging into your account using your email and password. Click the arrow beside your name in the top right corner and select "Order History" from the drop down. How do I purchase a firearm online? Most items ship within 2-3 business days from the day the order was submitted, unless noted. Some items may ship from multiple warehouses, so packages may come from different warehouses over a period of days. The best and most accurate way to calculate your shipping is to add the products to your Shopping Cart, click on the "Shopping Cart Page", then click the "Estimate Shopping Cost Button". How often is inventory updated? Product inventory is checked and updated regularly. If we are out-of-stock on an item, just click the notification button on the product page, and we will notify you via e-mail when the product becomes available. How old must I be to purchase ammunition? Federal law requires that you must be at least 18 years old to purchase shotgun ammunition and 21 years or older to purchase handgun and rifle ammunition. You do not need an FFL to purchase ammunition online. All Ammunition must ship UPS ground due to shipping regulations. For safety reasons, we cannot accept returns on ammunition. Make sure you use the correct ammunition in your specific firearm. Check your local laws before ordering. How do I sign up for our newsletter? I cannot receive emails from ableammo. An email whitelist is a list of accepted e-mail address that tells the mail system you use not to filter any e-mail from that address. Adding an e-mail to a whitelist means messages sent to your from @ableammo.com will always be delivered to your Inbox and will not be denied or filtered as spam. 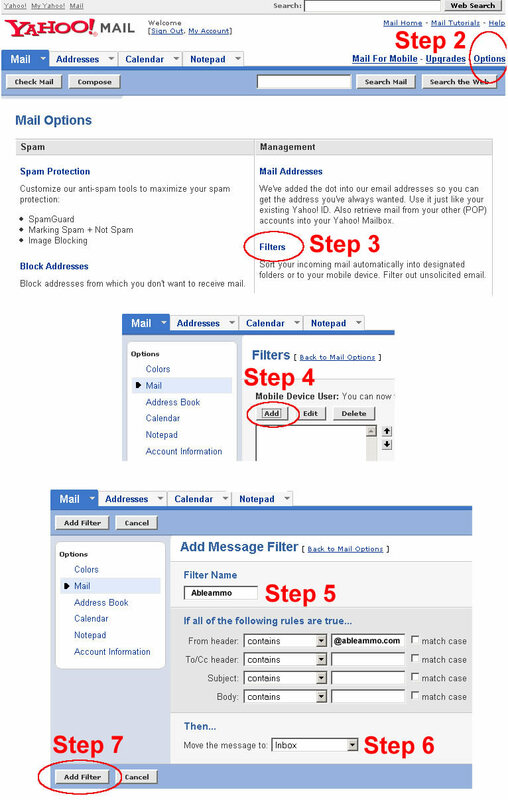 Follow the instructions below, for easy steps to add us to your whitelist, to ensure that you receive e-mails from us. Login to your AOL Mail. Click the "Settings" link (top right corner). Choose "Spam Controls" from the options on the left column. 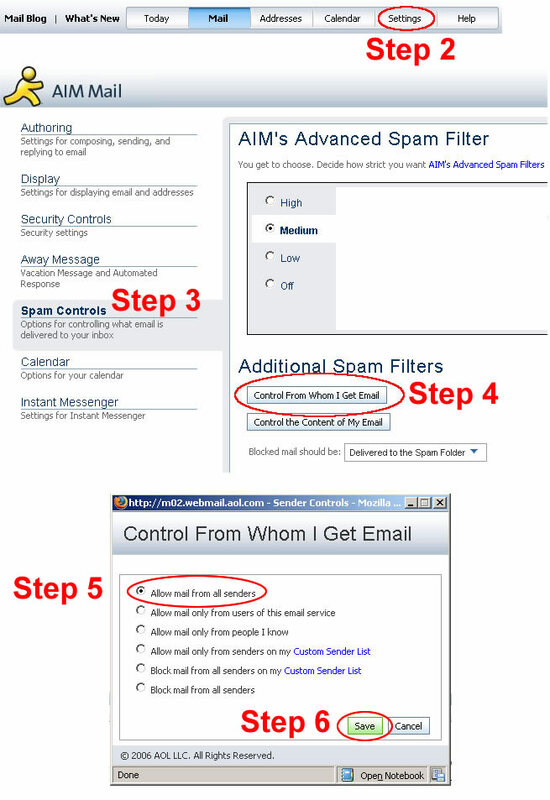 Under "Spam Filters" click "Control From Whom I Get Email". 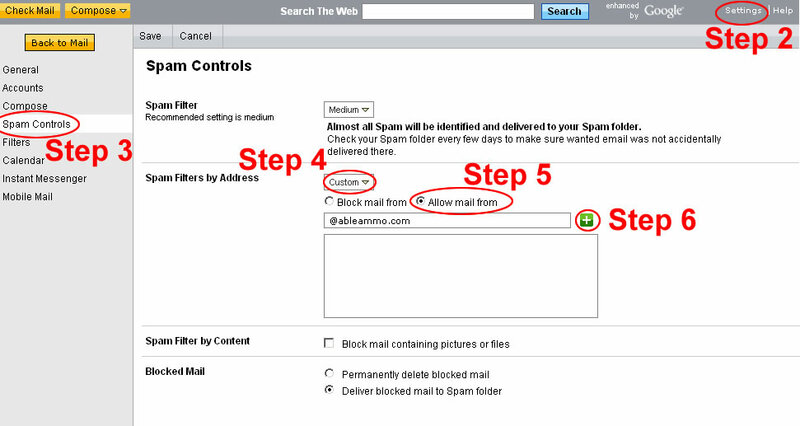 A popup appears - choose either "Allow mail from all senders". Click the green "Save" button. Login to your Yahoo Mail. Click on "Mail Options" (upper right hand corner). Click on "Filters" (middle column). Update the "From header:" rule with the following 2 pieces of information: "contains" and @ableammo.com. At the bottom, where it says "Move the message to:", select "Inbox" from the drop-down menu. Click the "Add Filter" button at the bottom to add this filter. 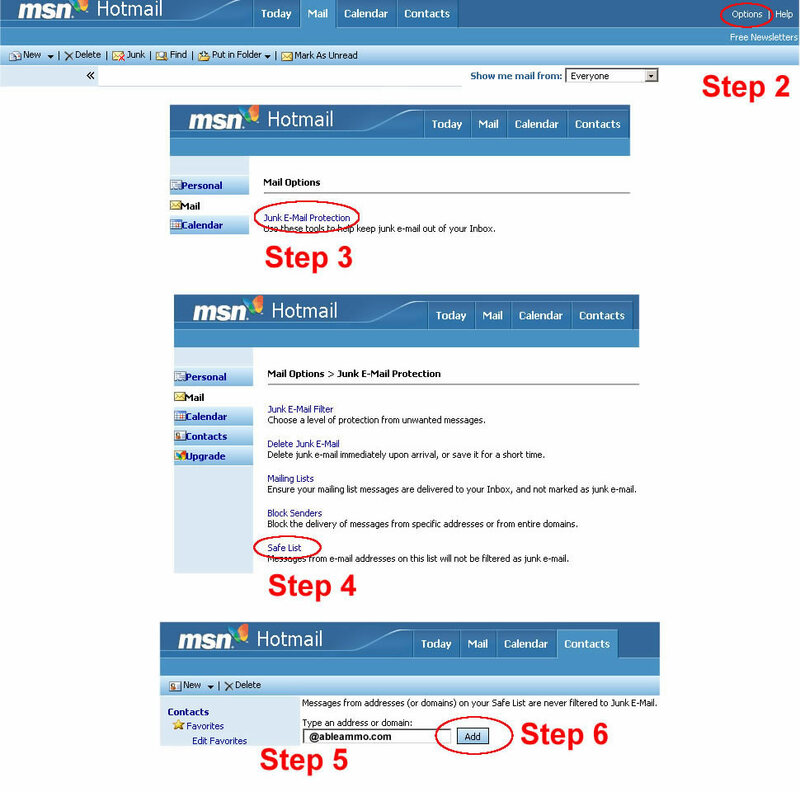 Login to your Hotmail Accout. Copy and paste @ableammo.com into the dialog box titled “Type an address or domain”. 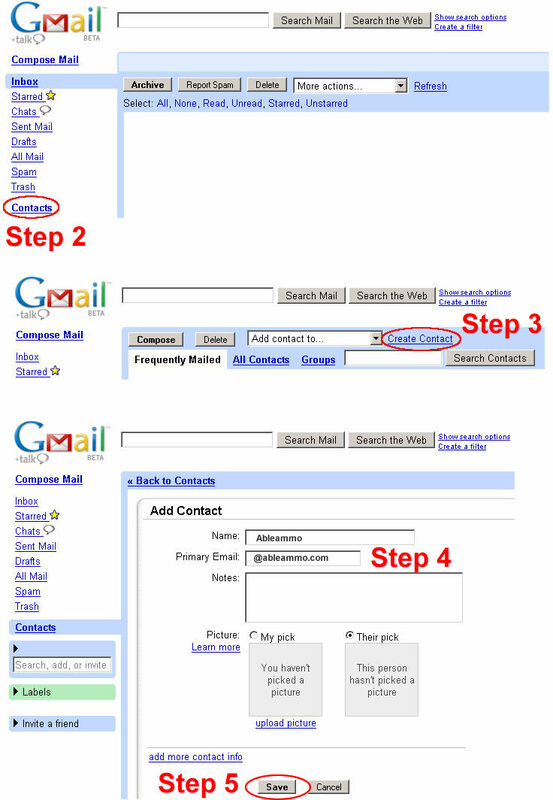 Login to your Gmail Accout. 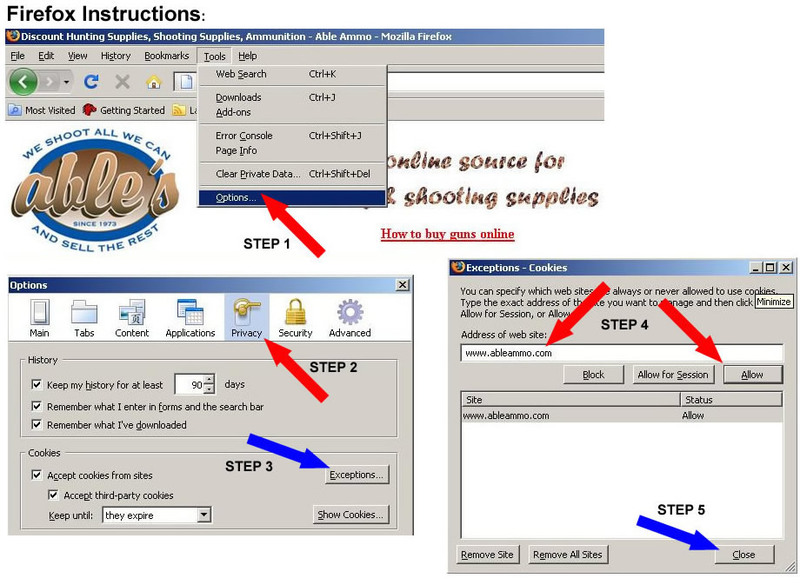 Copy and paste our e-mail address, @ableammo.com into the primary email address dialog box. If you forget your password, you can click on "Forgot Password" link on any page that requires you to login or just simply click here. This will bring you to a page where you should enter your registered email address. An email will then be sent to that address with a new temporary password. Once you have logged in with the new temporary password, you can click the arrow beside your name in the top right corner and select "Account Info" from the drop down. Click "Change my account password" on the newly loaded page to change your password to something of your own choice. I ordered the wrong item, what should I do? I placed an order, but was shipped the incorrect item. Contact our shipping department via E-mail. I received a defective item, what should I do? If the product is defective, contact our shipping department via E-mail for further instructions. I received a package that was damaged, what should I do? Contact our shipping department via E-mail. Our department will then contact UPS and file a claim. Is everything you sell listed on your site? Yes, all the products we carry are listed on our site. My order appears to be lost in transit. A claim will be filed for the lost package. You should contact Able's via E-mail, and we will file a claim with UPS. What is a product notification? This is a convenient way for customers to be notified via email when the selected product is back in stock. When a product is out of stock, how will I know when the product becomes available. If a product is showing out of stock, you can click the "Notify me by e-mail..." button and we will send you an email when the product becomes available again. My transaction was declined or cancelled, but it still shows up on my credit card statement. When your card-issuing bank receives an authorization request for a charge, they will confirm that the card number is attached to a valid account, and verify that your account has enough available funds to cover the requested amount. If the funds are in fact available, your card-issuing bank will reserve the funds on your card. The hold on the authorized funds will remain on your credit card until the card issuing bank removes the authorization. As a result, the held funds may be subtracted from your available balance, and an online statement may reflect the authorization request which might be mistaken for an actual charge. Most card issuing banks will remove authorizations within 3-7 days if they are not claimed for settlement. Once we void an authorization transaction, it is entirely up to your card-issuing bank how long the authorization stays on your account. We have absolutely no control over it, and cannot remove it from your account. You must call your bank or credit card issuer. My credit card has been charged, but product hasn't shipped. We do not charge the credit card until the order ships. What you may be seeing on your account activity is a pre-authorization verifying the funds are available. This is similar to when you reserve a hotel room, and they put a hold on the card for the amount until you are actually there and then they charge the card. The actual charge (post-authorization) will occur on the day your product ships. 1. By clicking on the link contained within the email for this express purpose. This will take you to the store\'s Redeem Voucher page. you will the be requested to create an account, before the Gift Voucher is validated and placed in your Gift Voucher Account ready for you to spend it on whatever you want. For any queries regarding the Gift Voucher System, please contact the store by email at customerservice@ableammo.com. Please make sure you give as much information as possible in the email.